Click the image above to read the second Issue of Paper Chained online, or read below for other access options. If you would like to print your own copy, we recommend printing with booklet print, double sided, flip on short edge, A3 paper size. 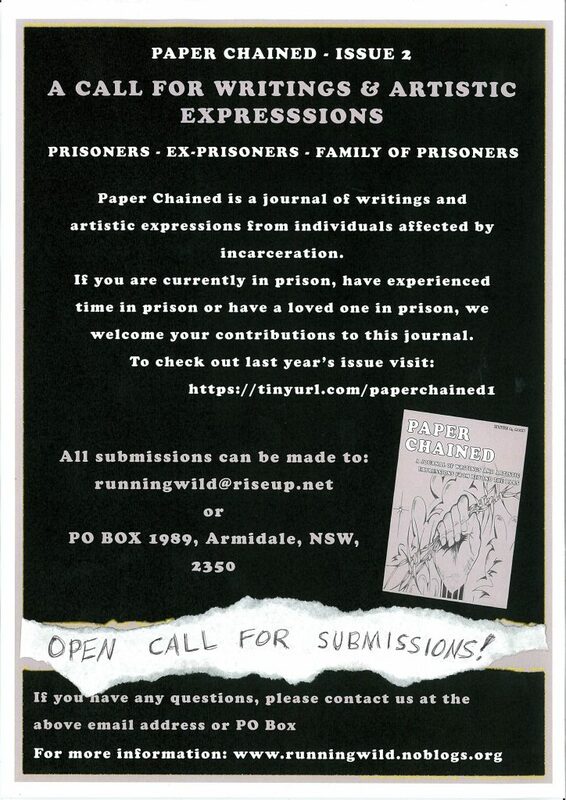 If you would like to request a printed copy of the journal, you can email us at runningwild@riseup.net or send a letter to PO Box 516, Stones Corner, QLD, 4120. Please note – if you can print your own or read online, please consider these options. We have limited funds and would like to prioritise printing for those who cannot access the journal through other means. We are calling for financial support to keep this journal going into 2019 and to support further distribution of the 2018 journal. please consider donating, any amounts are appreciated. 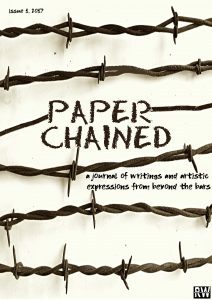 The first publication of Paper Chained was funded solely out of the pockets of a member of the Running Wild Collective who is a low-income earner and full-time student. The journal unfortunately cannot be sustained this way going forward and we are asking for assistance from the community to cover basic costs. 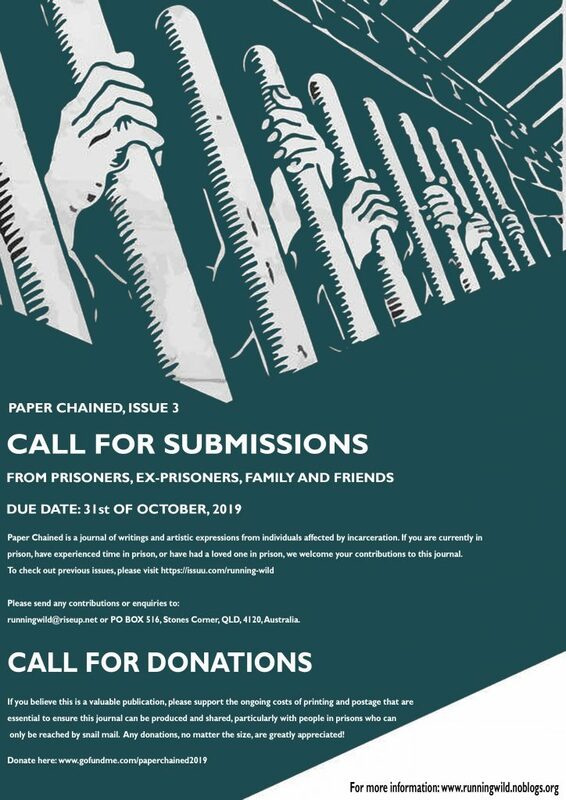 Costs include the lease of a PO Box to make submissions of writings accessible to those in prison ($129 per year), printing of journals so that we can send publications to people in prison and to community centers (roughly $5 per journal) and postage costs. We are aiming to raise $350 to cover the costs for 2018 – a relatively small sum if shared but a lot for one individual to take on. 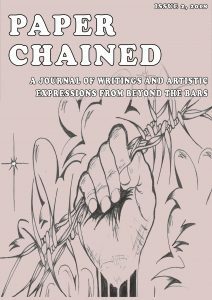 The first edition of this journal offered a space for people affected by prison to share their creative voices and their stories, it would mean so much to us to continue to offer this platform. Please donate if you can and spread the word about this fundraiser! It’s finally here! 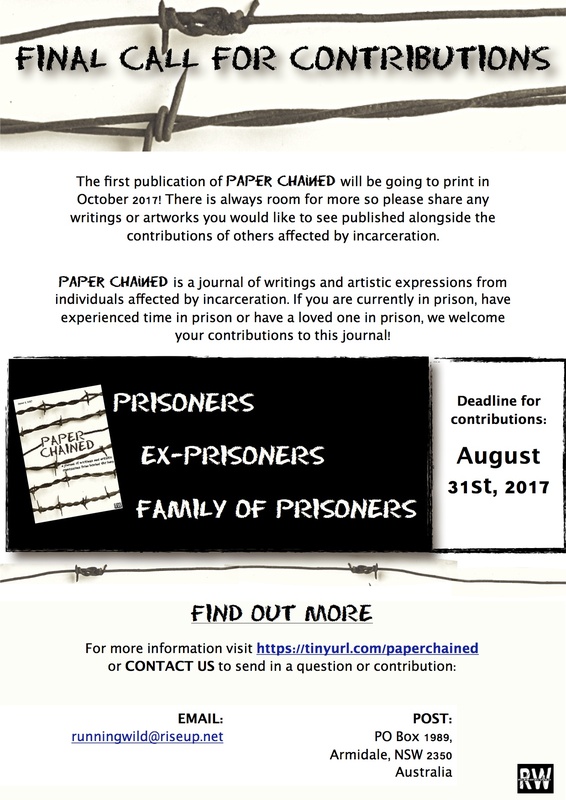 Click the image above to read the first Issue of Paper Chained online, or read below for other access options. Put your inner pages inside the cover, staple or tie together with string and enjoy!